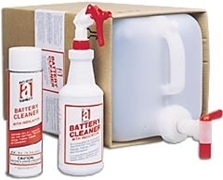 Battery Cleaner is a foaming cleanser that dissolves and neutralizes battery acid corrosion. The Visual Indicator turns RED in presence of acid. When the acid is neutralized the Indicator shows YELLOW. Simply spray on, wait two minutes, and wipe or flush corrosion away with water. Battery Cleaner is the complimentary product to Battery Protector and Sealer. To provide optimum protection after using Battery Cleaner, apply Battery Protector and Sealer. Applications: Use on all vehicle batteries such as: fork lifts, golf carts, cars, trucks, buses, and taxis. Also recommended for auxiliary generators and emergency equipment, railroad and construction equipment, and all other types of batteries in or out of storage.